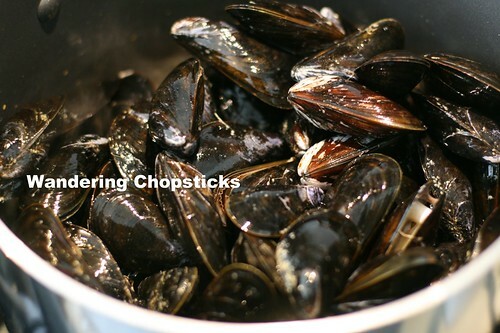 While grocery shopping at 99 Ranch Market in Monterey Park, I saw fresh black mussels on sale for $2.99/lb, or $9.99 for 5 pounds. 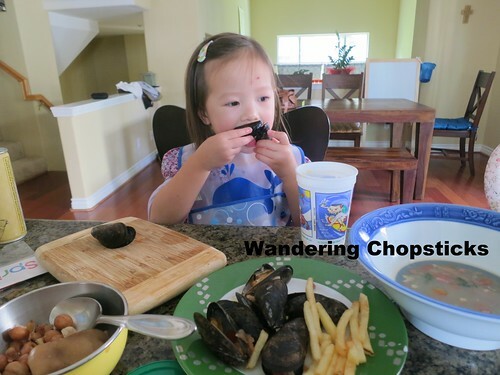 Remembering how much the niece loved eating mussels at Bistro De La Gare Restaurant & Wine Bar - South Pasadena, and because you know how much I love bivalves myself, I decided to go whole hog and buy the 5-lb bag. While Googling to make sure I spelled the dish correctly, I found out that moules frites is actually Belgian. Huh! 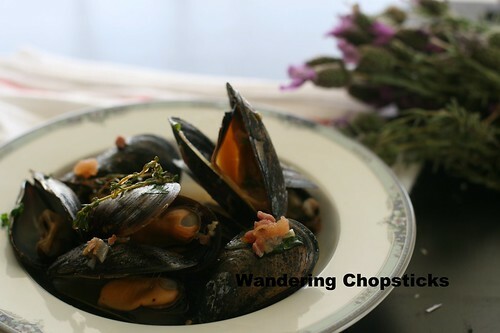 I always thought mussels with fries were French, and while they are quite popular in northern France and I've seen them on the menu in French restaurants, their origins are actually Belgian according to Wikipedia and Saveur. Learn something new every day. Optional: Serve with French fries or bread. 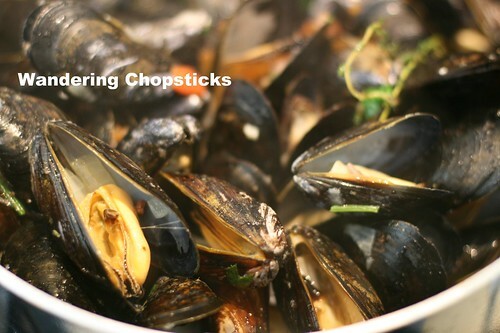 Place the mussels in a large bowl of water to rinse, making sure to discard any dead ones that have opened. Dice 4 strips of bacon and half of a large onion. 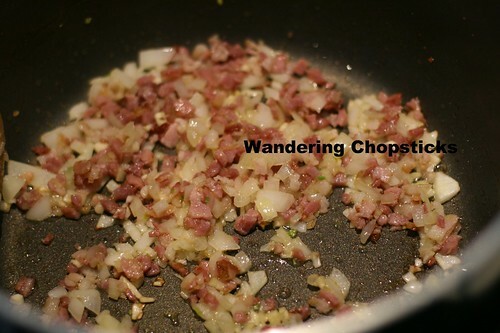 In a large pot on medium-high heat, add the diced bacon and onion and saute until the onion starts to soften. 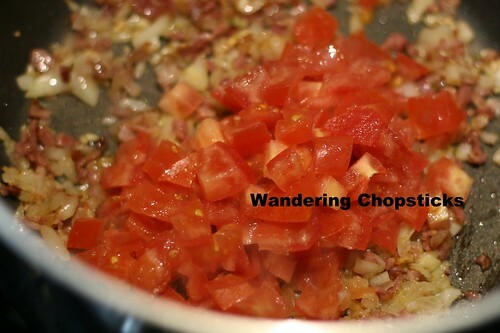 Add two chopped tomatoes and 1/2 tsp salt. 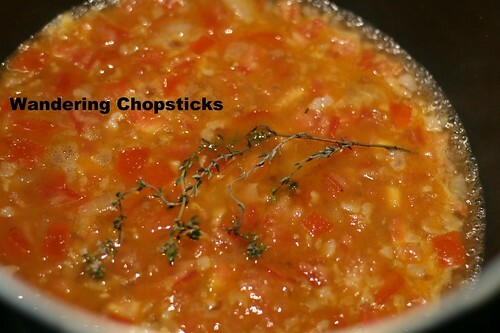 When the tomatoes have softened, add 2 cups of chicken broth and a sprig of thyme. You can also swap out one of the cups of chicken broth for white wine if you wish. Taste and add more salt if necessary. Stir to mix it all up and close the lid for about 5 minutes. The mussels should have steamed opened at this point. Ready to eat! 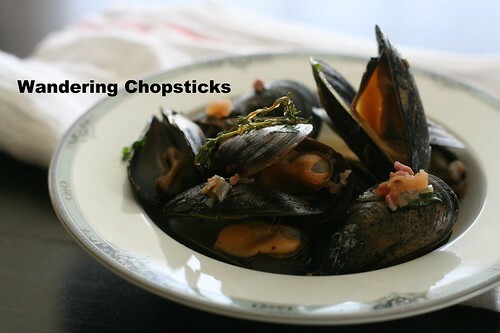 Scoop out the mussels into bowls, spooning the broth into each bowl. 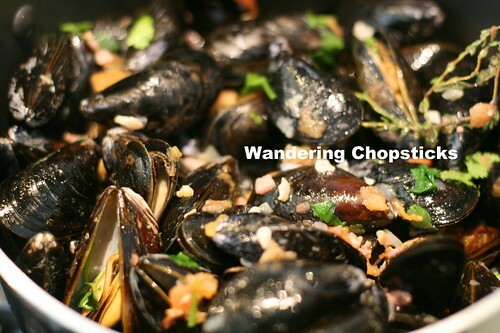 Look how juicy and yummy the mussels look. 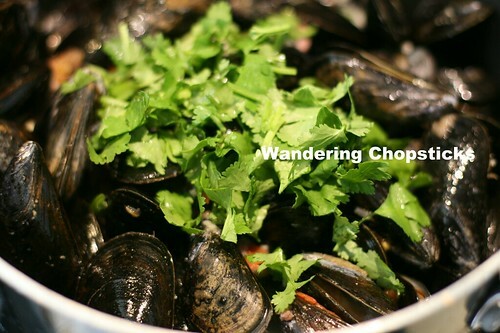 Instead of fries, you can also serve this with bread to mop up all that lovely broth in the bowls. 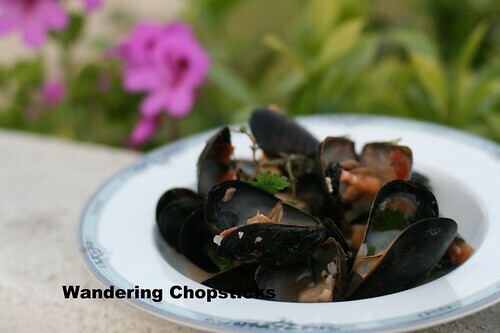 After taking the photos, I dumped the mussels back into the pot and made my way to my brother's house, stopping off at McDonald's along the way. Large order of fries to-go please! So there's the frites part of the recipe pictured below. We all ate until we were stuffed. The whole pot. Don't discard the leftover broth. All that lovely bacony seafood flavor makes great Clam and Shrimp Fettuccine. 1 year ago today, Vegetable-Dyed Crackled Eggs. 2 years ago today, Thirsty Lion Pub and Grill - Tigard - Oregon. 2 years ago today, Ga Kho Gung (Vietnamese Braised Chicken with Ginger). 3 years ago today, Palms Thai Restaurant - Los Angeles (Hollywood). 4 years ago today, Khmer classical dance at Koulen Restaurant - Siem Reap, Cambodia. 5 years ago today, lil' sis made star-shaped cupcakes. 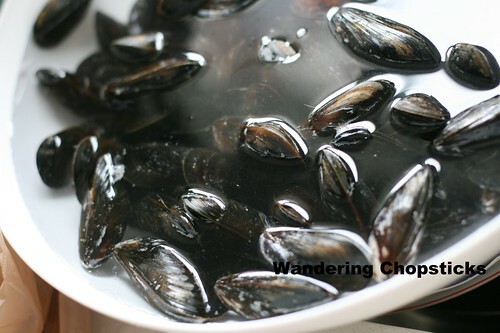 mussels is something that i have on my to "attempt at home" list. bookmarking your recipe for future reference! PS. your niece is soooooo cute! Right?! Well, I guess it's because there are far more French restaurants in the U.S. than Belgian ones. I mean, besides waffles and beer, I'm not sure Belgian cuisine has taken off in quite the same way. Really? 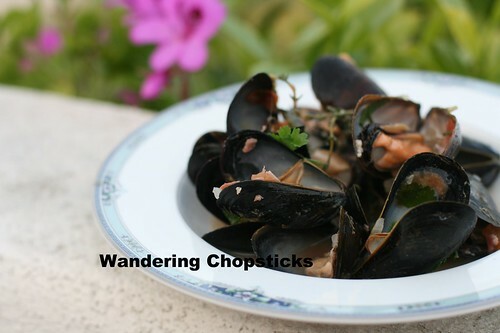 I would have thought you'd have tried more seafood because of where you are? I looove mussels. And clams. And oysters. And sea snails. Mmm.